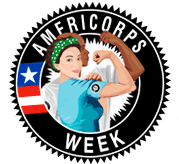 Every year, AmeriCorps Week recognizes AmeriCorps members and alumni for their service. The Alliance joined thousands of organizations across the country to celebrate the valuable contributions of the AmeriCorps members who pledge to “get things done” for America during the week of March 10th-March 16th. We are proud to be part of AmeriCorps and grateful for our VISTA (Volunteers in Service to America) members who are making a significant impact on domestic hunger relief, and AmeriCorps Week is a perfect opportunity to recognize their great work. Beginning in August 2017, the Alliance officially inducted the first cohort of AmeriCorps VISTA members. 8 full-time volunteers served at 8 Hunger Free Communities Network (HFCN) sites across the USA during Year 1 and focused on measuring hunger data within their service area; assisting with the development of an end-hunger plan; creating a coalition of various community stakeholders interested in ending hunger; and implementing a low income advisory board to determine solutions to food access. Now, the Alliance’s AmeriCorps VISTA program is seven months into Year 2 and has expanded to 11 full-time volunteers at 11 HFCN sites across the USA. Sites that have had a VISTA since 2017 are taking on sustainability efforts, in addition to continued capacity building, by recruiting and training volunteers; securing funds through special events and grant requests; and establishing tools and process to ensure ongoing community engagement and empowerment of the hunger-free community coalition and organization. In December 2018, the Alliance to End Hunger became a site of a full-time VISTA for the first time (apart from the VISTA Leader position) dedicated to supporting the HFCN by assisting in assessment and development, creating resources, sharing best practices and increasing collaborations within the network. In just the last seven months, the Year 2 VISTA cohort have recruited 272 community volunteers who performed 475.5 hours of service; leveraged $197,013 worth of in-kind resources; increased food security for 1,711 individuals; and grown their coalition efforts by enlisting 79 new organizations. There is no doubting the incredible impact our VISTA’s have on our communities is cause for celebration! “I’m thrilled to acknowledge the hard work of our VISTAs around the country. Each one of them brings unique talents and strengths to their communities but they all share a passion for service that is very inspiring,” said Minerva Delgado, the project director. Public, private, and nonprofit sector employers have also demonstrated their commitment to hiring AmeriCorps alumni, signing on to be an Employer of National Service, including the Alliance to End Hunger. We look forward to another successful year of our AmeriCorps VISTA program, aiming to place 13 hard-working volunteers at 11 HFCN sites committed to eliminating hunger nationwide. If you’re interested in learning more about AmeriCorps service, please reach out.